Nacházíte se: Booktook.cz → Odborná literatura → Cizojazyčné → Psychiatrie → Handbook of the Psychology of Aging 8th Ed. Handbook of the Psychology of Aging 8th Ed. 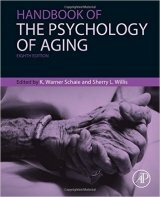 Handbook of the Psychology of Aging, Eighth Edition, tackles the biological and environmental influences on behavior as well as the reciprocal interface between changes in the brain and behavior during the course of the adult life span. The psychology of aging is important to many features of daily life, from workplace and the family, to public policy matters. It is complex, and new questions are continually raised about how behavior changes with age. Providing perspectives on the behavioral science of aging for diverse disciplines, the handbook explains how the role of behavior is organized and how it changes over time. Along with parallel advances in research methodology, it explicates in great detail patterns and sub-patterns of behavior over the lifespan, and how they are affected by biological, health, and social interactions. New topics to the eighth edition include preclinical neuropathology, audition and language comprehension in adult aging, cognitive interventions and neural processes, social interrelations, age differences in the connection of mood and cognition, cross-cultural issues, financial decision-making and capacity, technology, gaming, social networking, and more.